Trains are the best way to get to and from Kyoto. You can also explore some parts of the city by train. Here, I’ll give a quick overview of Kyoto’s train system and some links to free English-language route maps. 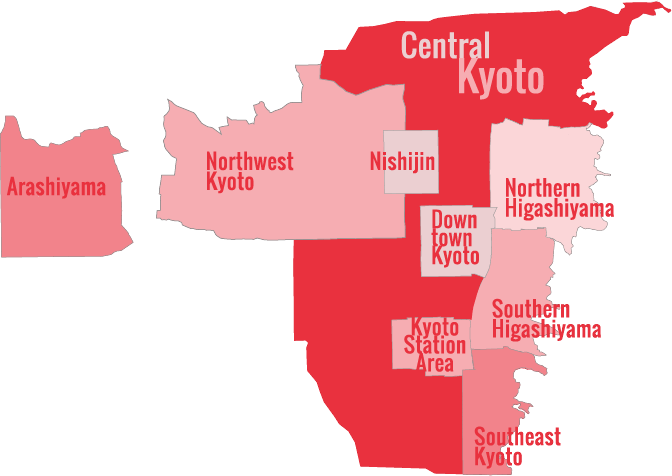 Kyoto’s train system consists of the national JR Line and several local private lines. While trains are not the most convenient way to explore within Kyoto (buses and subways are more convenient), you can get some place by train within Kyoto: Arashiyama, Uji and Tofuku-ji are some of the places you can visit by train from Kyoto Station. Also, if you want to go to nearby cities like Osaka, Otsu, Kobe or Nara, trains are the way to go. JR trains run to all these places. If you have a JR Rail Pass, you’ll want to use JR trains to visit these places. However, in some cases, private lines are more convenient. For example, the private Kintetsu Line is a faster and more convenient way to get to Nara than the JR Nara Line. See also my page of information on special train, subway and bus ticket deals. You can download a free English-language PDF of the entire west Japan JR rail network from the official JR website. (link opens PDF directly). You can also download a free English-language PDF of the Kyoto train and subway system from the official JR Pass website (link opens PDF directly). Kyoto is on the main JR Tokaido/Sanyo Shinkansen (bullet train) Line, which connects Tokyo, Nagoya, Kyoto, Osaka, Kobe, Himeji, Hiroshima and points west. This line is the best way to travel between Kyoto and the other cities on this line. You can buy shinkansen tickets online with GoVoyagin. Kyoto is also on the JR Tokaido main line, which connects Kyoto Station with Osaka, Kobe and Otsu (among other places) via local and express trains. If you don’t have a JR Rail Pass, taking the shinkaisoku (express) on this line is a good way to travel between Kyoto and Osaka or Kobe. If you have a JR Rail Pass, don’t waste time on the shinkaisoku, just jump on the shinkansen (bullet train): the shinkaisoku takes about 45 minutes between Kyoto and Osaka, while the shinkansen takes around 12 minutes. The JR Nara Line connects Kyoto Station with Nara in about 45 minutes. Note that a tokkyu (limited express) on the private Kintetsu Line is a faster and more comfortable option. 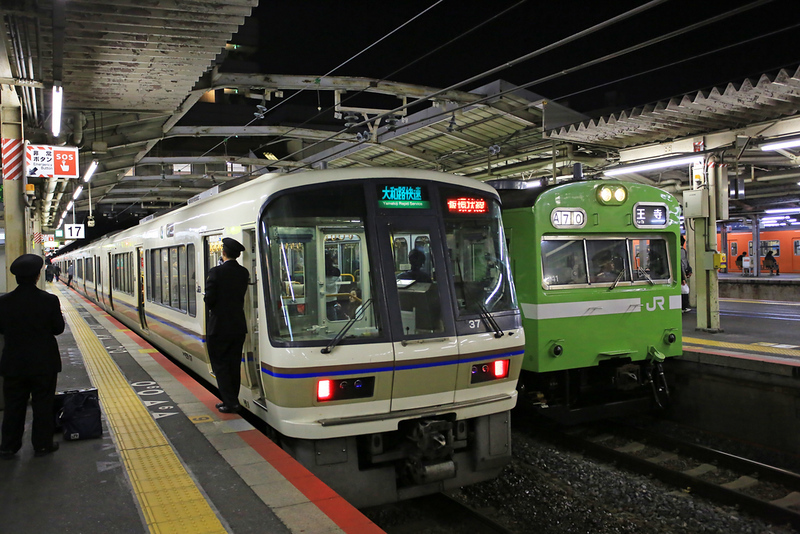 The JR Nara Line also connects Kyoto with Uji in about 20 minutes (Uji is a suburb of Kyoto with a few interesting sites like Byodo-in Temple). The JR Sagano-San’in Line connects Kyoto Station with Arashiyama (Saga-Arashiyama Station) and more distant destinations like Kinosaki Onsen. The JR Hokuriku Line connects Kyoto Station and destinations northeast of Kyoto, like Kanazawa and Toyama. The private Keihan Main Line runs from Demachiyanagi Station (beside the Kamo-gawa River in the north of the city, at Imadegawa-dori Street) all the way to Yodoyabashi Station in downtown Osaka. In Kyoto, it stops at Marutamachi, Sanjo, Gion-Shijo, Kiyomizu-Gojo, Shichijo, Tofukuji and Inari stations. If you find yourself near the Kamo-gawa River, it’s a very convenient way to move north and south in the city. I usually use the Keihan Line to visit Tofuku-ji, Fushimi-Inari-Taisha Shrine and Uji. I also use it to access the Eizan Eiden Line (see below), which runs to Kurama and Kibune. Because I don’t usually have a JR Rail Pass (which is only available to tourists and not residents like me), I often use the Keihan Line to travel from Kyoto to Osaka. The tokkyu (limited express) trains on this line are more comfortable and less crowded than the shinkaisoku (express) trains on the JR Line. Also, you can board the Keihan Line at several stations in Kyoto, and you don’t need to head all the way south to Kyoto Station for the JR. The private Hankyu Main Line runs between Kawaramachi Station (in the heart of downtown Kyoto, near the Kamo-gawa River) all the way to Umeda Station in downtown Osaka. In Kyoto, it stops at Karasuma, Omiya, Saiin and Katsura stations. At Katsura Station, you can transfer to the Hankyu Arashiyama Line, which takes you to Arashiyama Station, convenient for Arashiyama. Because I don’t usually have a JR Rail Pass, I sometimes use the Hankyu Line to travel from Kyoto to Osaka. The tokkyu (limited express) trains on this line are more comfortable and less crowded than the shinkaisoku (express) trains on the JR Line. Also, you can board the Hankyu Line at several stations in Kyoto, and you don’t need to head all the way south to Kyoto Station for the JR. The private Kintetsu Line connects Kyoto with Osaka, Nara, Mie Prefecture (for Ise-shi and Ise-jingu Shrine) and Nagoya. For travelers without JR Rail Passes, the Kintetsu Line is the best way to travel between Kyoto and Nara or Ise-shi (for Ise-Jingu Shrine). For both of these destinations, I highly recommend a Kintetsu tokkyu (limited express train). The private Keifuku Line is the last line of street trams in Kyoto (the city used to be criss-crossed by street trams). The Keifuku Line starts at Omiya Station (at the intersection of Shijo-dori and Omiya-dori, a bit west of downtown). From there, it runs west to Arashiyama and Kitano-Hakubaicho, with stops at places like Omuro-Ninnaji (convenient to Ninna-ji Temple) and Ryoanji (convenient to Ryoan-ji Temple). This line is of relatively minor importance for the traveler, but some might want to try it to get a taste of what traveling around Kyoto used to be like. The private Eizan Line runs from Demachiyanagi Station (beside the Kamo-gawa River in the north of the city, at Imadegawa-dori Street) to the villages of Kibune and Kurama in the Kitayama Mountains in the north of the city. If you want to visit either of these destinations, the Eizan Line is THE way to go. The Eizan Line also runs to Yase-Hieizan-Guchi Station, at the base of Mt Hiei-zan, in the northeast corner of the city. From this station, you can take a funicular to the top of the mountain.